“I make this salad all year round, varying the salad content according to the seasons and availability but I like it best of all in spring” says Rory. Rory says: “Mixed organic leaves are the most obvious option but the salad works very well with just crispy watercress or chicory leaves. Wild garlic leaves are a great addition in spring as are the pretty white garlic flowers. As always choose the best quality oil and vinegar and measure accurately to ensure a correct balance of acidity in the dressing. “Free-range eggs, hard boiled and yolks sieved are what create the mimosa effect here and hence the use of the word in the recipe title. A selection of spring salad greens or a specific leaf like watercress or chicory can be used here. Try and get free-range or organic eggs. Large fleshy olives like Kalamata are perfect here. To stone an olive, place one at a time on a chopping board and press with the back of a chopping knife to press out the stone. Otherwise use an olive stoner if you have one. 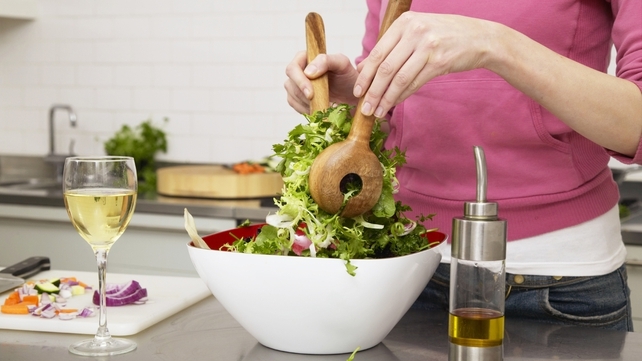 Using a swivel headed vegetable peeler, shave the parmesan thinly off a larger piece straight on to the salads. Don’t worry if the parmesan breaks up a little and certainly perfect curls are of no advantage here, in fact perfect curls of parmesan can indicate an immature cheese. Much of what is sold as balsamic vinegar is of poor quality, so search out a quality vinegar and if in doubt about the quality, replace it in the recipe with lemon juice of a good sherry vinegar. Hard boil the eggs by lowering them gently into a saucepan of boiling, salted water and cooking them at a boil for exactly 10 minutes. If you don’t want the yolk completely hard, cook for 9 minutes. The salt in the water seasons the egg and will help to coagulate any white that might seep out of a crack in the shell, hence less leakage. Remove from the saucepan immediately and cool under a cold running tap. Remove the shell and cut the hard boiled eggs in half. Pass the yolk through a sieve, using the back of a soup spoon to push the egg through to achieve a mimosa type effect. Keep the chopped white and sieved yolk separate. Stone the olives by gently squashing them on a chopping board with the back of a chopping knife and removing the stones. Chop the olive flesh finely and reserve. Mix the ingredients for the dressing together, taste and correct seasoning. Place the leaves in a large bowl and dress with just enough dressing to make the leaves glisten. On four large plates, first place a wide broken circle of the chopped olive on each plate. Divide and spread the egg white in the centre of the circles of olive. Place the leaves in a light pile on top of the egg white. 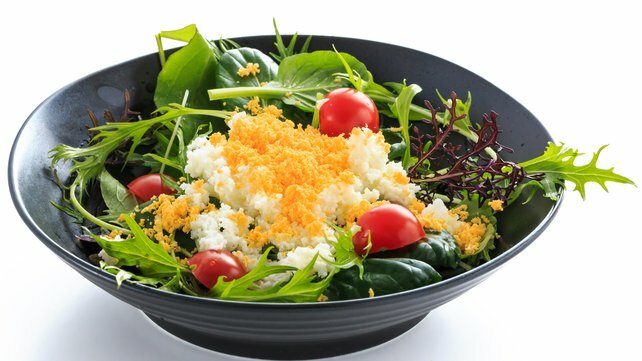 Gently, place 3 parmesan shavings or pieces on each salad. Finally sprinkle the egg yolk “mimosa” on each salad. Previous PostPrevious Homemade Pappardelle Pasta#sweetgeraniumcafe.Drumshanbo Co.Leitrim.